An alien spaceship landed on Central Park and opened its pod bay doors today, and as far as we know, the world has yet to be incinerated. 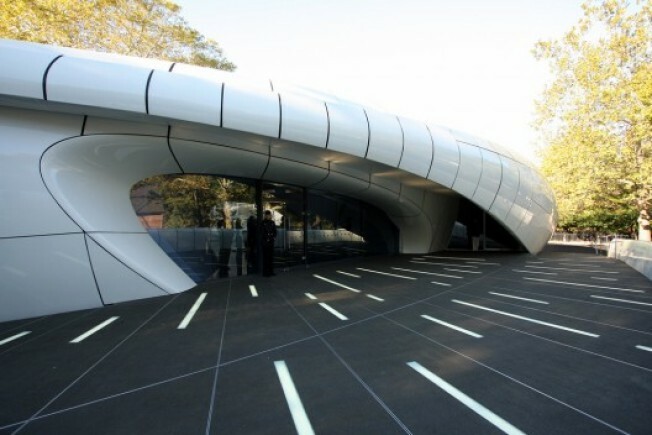 The ship, also known as the Chanel Mobile Art Pavilion, was designed by architect Zaha Hadid under the guise of doubling as a corporate-sponsored roving art exhibition. A crew of humansmind control?were recently spotted fiddling with the ship at Rumsey Playfield. Racked was on the scene this morning, and they have agreed to share some of the photographic evidence with us. Once inside, visitors are given space-age "MP3" devices that quickly put them under a spell as a smoky voice whispers hypnotic nonsense such as "Life is defined by forms" and "We are only skin." The ship's scheduled departure is November 9th, and while free tickets for entry are sold out, a small batch will be dispersed to desperate earthlings craving A New Way each morning at 8 a.m. No word on whether Hadid, whose only permanent New York City work is the penthouse at the Hotel on Rivington, has instructed her minions to destroy the Guggenheim.